12 years ago, I concocted a plan to single-handedly provide enough eggs for all of the teachers in the greater Pittsburgh Area to use in their classrooms. At the time I was operating under a theory that in order to really understand monarchs, a child should only raise monarchs that hatched from locally laid eggs. My ideas about that have evolved a bit over the years. I now believe that both teachers and students would learn more about monarchs if they went out into the milkweed patches growing in their community and found monarch eggs themselves. It immerses them in the ecosystem of the milkweed patch and gives them a context from which to understand the monarchs. But that year I was intent on finding local, wild-laid eggs in August in huge quantities. Luckily the word hadn’t gotten out that I would be providing so many eggs, but I did have a few teachers waiting. I spent a great deal of time combing through several milkweed patches nearby. One day after checking all of the logical places for a monarch butterfly to lay her eggs, I wandered deep into a thick stand of A. syriaca ramets and found that some monarch was laying eggs way down on the bottom leaves in the center of the patch. There is no way that she could be flying down there. The leaves were broad and overlapping. The eggs were all on the bottom sides. She had to be landing and crawling down into the milkweed thicket to lay her eggs. There continued to be eggs in that part of the milkweed patch for about 3 weeks. I never actually saw the monarch who was laying them, but it was the seed of a hunch: individual monarchs tend to lay eggs over and over again in similar places. In the following years I had tents full of breeding monarchs with little sharpie dots and dashes on their hind wings that identified them and I noticed a pattern. Many butterflies stuck to the traditional bottom-side-of-the-top-leaves egg laying strategy, but I observed butterflies who consistently preferred to lay their eggs on pods, or stems, or the top of leaves, or on buds. This spring, egg laying in my Waystation (#4970 Union, WV 37.56 , -80.51) began on April 27. It is continuing daily. 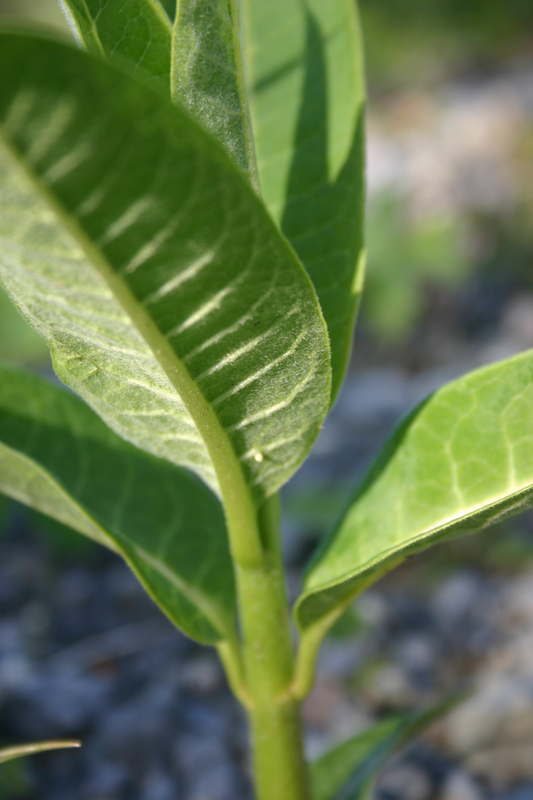 Many more milkweed shoots are up and many respectable, robust plants (8+ fully extended leaves) are present. This is the earliest in the 6 years that I have been in this area that I have seen this much continuous egg laying this early. Though I am sure egg laying was occurring in May, it seems that in the past it was more sporadic and I didn’t encounter it with such frequency. The butterflies are not being any more cooperative than ever about showing up so I have a chance to watch them, so I am guessing about who is laying eggs by how the eggs are laid. I thought that the eggs I had seen up until today had all been laid in the usual manner—on the under side of leaves near the top of the plant. Since that is the most common way for eggs to be laid, they could easily have been laid by different females or by just one. While checking milkweed in my garden this afternoon, I found 6 eggs laid on the top of leaves on six different plants. Going back through my photos I was surprised to see that one of the eggs I found earlier was also laid on the top of the leaf. I wonder, do I have a single monarch with variable egg laying preferences who is still here after 9 days? Are there two or more different monarchs laying eggs in my area? 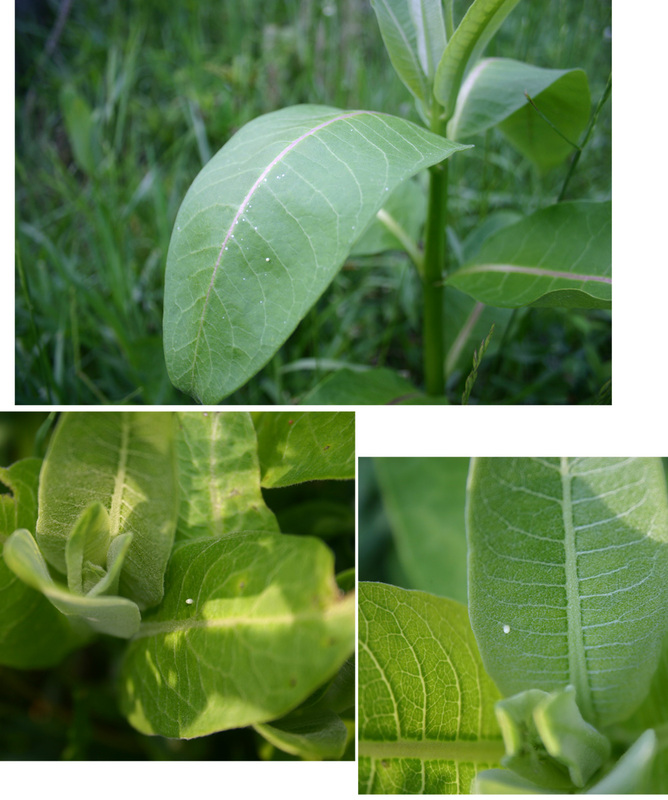 Is there something about the milkweed this early that inspires more monarchs to lay eggs on the top of the leaves? I’ll keep watching and see if I can find a pattern. It will be interesting to see how distribution of monarchs works this season with so many monarchs so far north so early. Since the migration seems to be cued by sun angle and seems to continue until the end of June, will that mean that the breeding area goes further north? Will the more southerly breeding areas continue to be active? Will it matter what the summer temperatures are? We’ll all just have to monitor our areas and see what happens. This entry was posted in Migration north, Milkweed, Monarch butterfly, Monarch eggs, Monarch migration, Monarchs on the Knobs, Uncategorized. Bookmark the permalink.